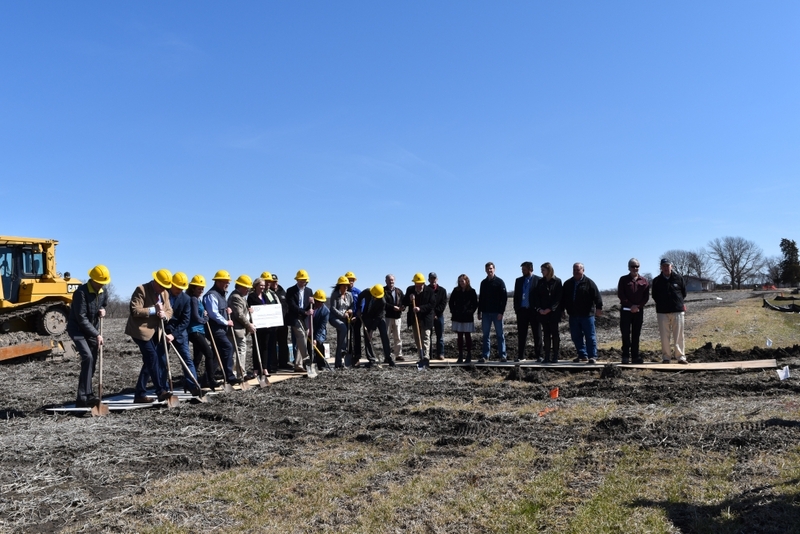 FAIRFIELD, Iowa (March 26, 2019) – Groundbreaking took place today on construction of a new 30,000 square-foot shell building in Fairfield’s newest business & industrial park. 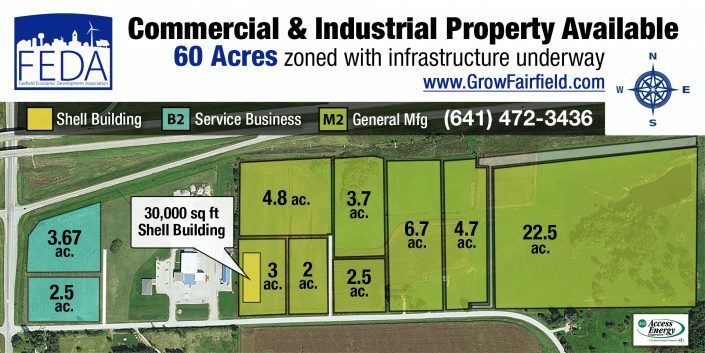 Fairfield Economic Development Association (FEDA) announced the facility will be located on a three-acre parcel within FEDA’s 61-acre Business & Industrial Park and will be marketed to businesses considering expanding within, or relocating to, Fairfield. “We’ve had companies look at Fairfield, but we didn’t have the available building stock with the matching needs,” said FEDA’s executive director, Joshua Laraby; “some of the main issues have been low eave heights and limited clear span construction with existing buildings,” he added. The location is prime for business, being adjacent to the Highway 1 – Highway 34 interchange on Fairfield’s southside. The project is a culmination of discussions which began in early 2016, to position the City of Fairfield for further growth and creation of new jobs. With the advisory support of Iowa Area Development Group (IADG), by August 2016, a 28E partnership agreement was formalized between FEDA and The City of Fairfield, Jefferson County, Access Energy Cooperative, and Northeast Power. Laraby says a strong partnership has made the new park shovel ready. FEDA purchased the most recent 55 acres in 2015, with intent to develop the site into a new Business and Industrial Park. By 2016 FEDA had completed bringing sanitary sewer infrastructure to site with the assistance of a low interest loan from Access Energy Cooperative’s revolving loan fund. Later that same year, Access Energy Cooperative invested in bringing 3-phase electric to the site – positioning the site for commercial and industrial development. FEDA also partnered with CR Signs of Cedar Rapids to bring a new community-impact billboard along Highway 34, bringing more exposure to Fairfield. Last year, 227th Street was newly paved with the assistance of the City, County, and an Iowa DOT RISE Grant. Shortly thereafter, the United States Department of Agriculture Rural Development awarded Access Energy Cooperative a $300,000 grant, plus $60,000 in matching funds from the Cooperative, for the Fairfield shell building project, which in turn is available to FEDA in the form of a loan. “Breaking ground today on a new industrial building in a new industrial park is exciting, as FEDA and its partners open another era of providing the infrastructure necessary for local business to grow. 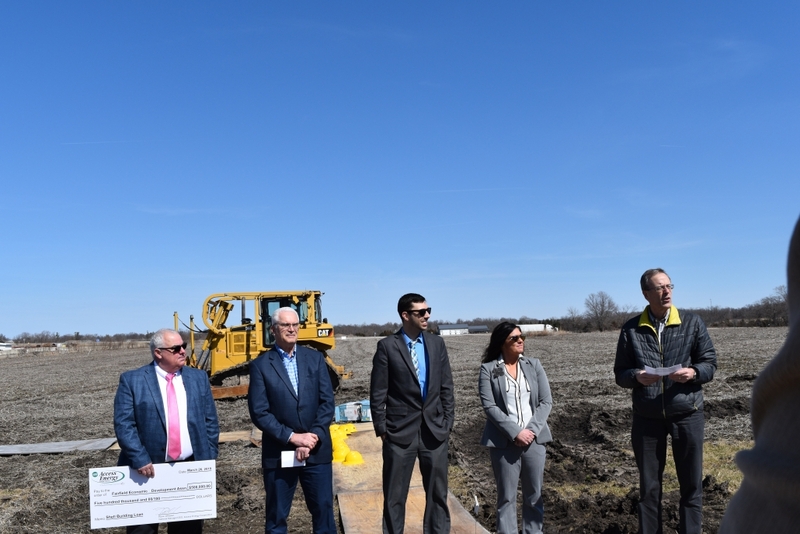 We thank our partners: the City of Fairfield, Jefferson County, Access Energy Cooperative, Northeast Power and Iowa Area Development Group for their cooperation and support for this project,” said Tim Kuiken, FEDA Board President. Schaus-Vorhies Contracting of Fairfield was awarded the bid for General Contractor for the project. The 100 x 300-foot steel frame construction will boast a 27-foot eave height and will be manufactured by CECO Building Systems in Mt. Pleasant, Iowa. FAIRFIELD, Iowa – January 18, 2019 – When the new owners of FairCast began operations in June 2017 they wanted to install energy-efficient equipment to improve the facility and its operations. A $43,797.86 rebate from Alliant Energy helped the iron casting company upgrade its air compressors and bag house pollution control system. These improvements will reduce FairCast’s energy use by over 345,000 kWh and save the Fairfield, Iowa company approximately $27,000 a year on their energy bills. “This project is going to make us more energy efficient and will assist us in improving our bottom line,” said Ken Ledoux, FairCast president and general manager. “It has been a pleasure to work with the FairCast team,” said David Vollmar, key account manager for Alliant Energy. “We appreciate their commitment to reduce their impact on the environment and applaud their focus to pursue energy efficiency projects. Custom rebates are available to Alliant Energy’s retail electric and gas customers located in the company’s Iowa service area. For more information, visit alliantenergy.com/customrebates or call 1-866-ALLIANT (866-255-4268). Photo (from left to right): FairCast Board Member Roger Vorhies, Alliant Energy Senior Account Manager David Vollmar and FairCast Plant Manager Jim Steinbeck. Alliant Energy Corporation’s Iowa energy company, Interstate Power and Light Company (IPL), utilizes the trade name of Alliant Energy. The Iowa utility is based in Cedar Rapids, Iowa, and provides electric service to 490,000 retail customers and natural gas service to 220,000 retail customers. The employees of Alliant Energy focus on delivering the energy solutions and exceptional service their customers and communities expect – safely, efficiently and responsibly. Alliant Energy Corporation (NASDAQ: LNT) is traded on the New York Stock Exchange and is a component of the S&P 500. For more information, visit alliantenergy.com. (October 9th, 2018) Creative Edge Master Shop has been a pillar of the manufacturing community in Fairfield for the past 30 years. Now CEO Jim Belilove has announced a transition of ownership to a chosen buyer, Weaton Capital, which will continue Belilove’s legacy and retain operations in Fairfield. The sale includes two other divisions of Creative Edge (ToolKeepers and Resilient Flooring) and became effective October 1st, with Belilove remaining involved as a principal for four years. Weaton says that his company’s guiding principle is to protect and value the founder’s legacy when they invest in a company. “We hung out our shingle because we want to be local, we want to invest in Iowa businesses,” he says. It’s a story of successful Fairfield development—first because Jim Belilove and Creative Edge have been important supporters of FEDA and the Fairfield business community for 30 years, and second because Weaton Capital, a new Fairfield business, is providing security for Creative Edge’s employees and retaining its Fairfield location into the future. In many ways, it’s a happy continuation for a story that started 30 years ago. “From the start, Creative Edge was a local business that not only promoted growth in Fairfield but had a global reach,” says Laraby. Back in 1988, abrasive-waterjet technology was relatively unknown, used for cutting frozen vegetables and windshields, its artistic potential untapped. It was Creative Edge that pioneered the use of waterjet-technology to create intricate, Renaissance-quality designs for stone and tile flooring. Today the Creative Edge brand is known all over the world for creating more than 10,000 floors and wall murals in hotel lobbies, airports, children’s hospitals, churches, and government buildings from the U.S. to Saudi Arabia. The sheer range of their projects is astounding. Just a few of their high-profile, award-winning projects include the Astronaut Memorial at Kennedy Space Center, the visitor’s center at West Point and the entryway to Disney World in Florida. Three recent projects that won major national industry awards: the marble lobby medallion at the Bellagio Las Vegas; the steel-and-granite Spotlight on Broadway sidewalk installation in Times Square; and the 69,000-square-foot decorative terrazzo floor at the Pittsburgh International Airport. According to Laraby, Creative Edge has been an iconic Fairfield employer. Many of Belilove’s 40 employees have been with him for 20 years or more—and he’s already retired 16 people who have spent their full career with Creative Edge. Creative Edge has also been generous in installing their beautiful art in key locations in Fairfield. Local installations by Creative Edge include spectacular lobby floors of the Fairfield Arts & Convention Center, the Student Center at Maharishi University of Management, First National Bank, Iowa State Bank, Libertyville Bank, the Jefferson County Veteran’s Monument and new storefront signage as part of the recent renovation of the town square. Laraby also notes that Creative Edge has been a stable resident within FEDA’s first industrial park, occupying their own 120,000-square-foot building. Finally, Creative Edge is one of the few Fairfield companies that exports a made-in-the USA product to other countries, contributing to both the national and local economies. Belilove and his wife, Ginger, have also been strong supporters of the arts and business community in Fairfield. Jim Belilove points out that Iowa is now rated the best state in the country for a wide variety of factors such as business opportunity, education, and quality of life, according to US News & World Report’s Best States Rankings. The supportive financial structure is one reason Fairfield is a fertile ground for business. Belilove says that Creative Edge has received essential loans through FEDA and local banks over the years. “Management and ownership succession are universal challenges for businesses across Iowa. I couldn’t be more pleased with Jim and Nate coming together to solve both of these issues for Creative Edge. They’re a powerful duo and will complement each other very well,” says Aaron Kness, President/CEO of Iowa State Bank & Trust Co.
Belilove feels that it was Iowa State Bank’s confidence in Creative Edge that not only allowed him to continue but also led to other important financing, such as the six low-interest loans provided by Regional Economic Development Incorporated (R.E.D.I.) that he has received through FEDA. With their most recent R.E.D.I. loan, for instance, Creative Edge was able to purchase new waterjet machines and upgrade existing equipment. With Belilove’s love of Fairfield and his investment in the community, he was looking for a transition partner who would continue operating Creative Edge from Fairfield. 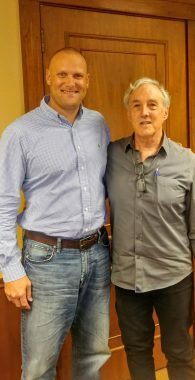 “I knew I wanted a buyer who considers being located in the state of Iowa and the city of Fairfield to be good thing, not just something you have to put up with, or somewhere you don’t really want to be,” says Belilove. But as the years passed without finding the right partner, he was beginning to wonder. “My wife joked that I would be still working here until I reached 100,” says Belilove. 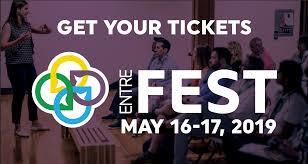 Weaton brings a wealth of relevant experience to the Creative Edge purchase agreement. His career has a solid balance of entrepreneurial ventures and large public-company experiences. Most recently, he was with Dover Corporation serving as Vice President and General Manager of their Hill Phoenix Specialty Products Division inn Keosauqua, IA, their Case Division in Richmond, VA, and ended his career with Dover Refrigeration and Food Equipment as Senior Vice President of Business Development. In 2017 he left Dover and made the decision to work in Fairfield, where he has lived for the past 20 years. He has deep roots here, raising a family of five children, with his youngest in 7th grade. His wife, Lori Schaefer-Weaton, is president of Agri-Industrial Plastics in Fairfield. Nate Weaton also serves on the board of ABI and is active in organizations such as Elevate Iowa and Elevate Manufacturing. Weaton and his partners are passionate about working in Fairfield and giving back to the community. He volunteers as a Fairfield High School football coach, and is involved in a series of civic outreach organizations, from Habitat for Humanity to Little Super Heroes Foundation to the Fairfield Arts and Convention Center. All of his business experience—and his Fairfield connection—comes into play in his new role at Weaton Capital. “We can take all the experience in the big company and bring what was good about it back to Fairfield—bring the resources back, bring the relationships back, the connections back,” says Weaton. Weaton Capital is poised to invest in other businesses in Southeast Iowa because Nate Weaton sees it as a great place to do business. Weaton and his partners feel that the Creative Edge agreement is a good working model for other companies they invest in: as with Creative Edge, they plan to be hands on, to be involved with day-to-day operations, and to continue the founder’s legacy. In other words, Weaton Capital provides something that many small businesses are lacking: a succession plan. Belilove says that he’s willing to be a poster child for the kind of succession planning that Weaton Capital provides. “They can invest in companies and help them expand and grow and continue for generations in the way the founder intended,” he says. Belilove laughs when he shares the way he pictures the transaction. Fairfield, Iowa, September 12th, 2018 – The USDA Rural Development has announced an economic development grant to be awarded to Access Energy Cooperative for a shell building in the Fairfield Business & Industrial Park. 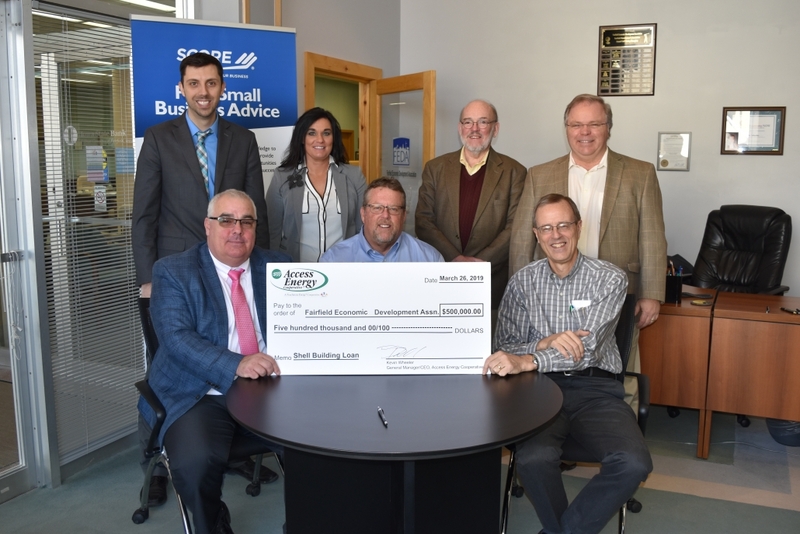 Once the grant is received, Access Energy Cooperative will loan the grant money of $300,000, plus $60,000 in matching funds, to the Fairfield Economic Development Association for construction of the shell building. Once the building is sold and the loan has been paid back, the money will become part of the Access Energy Cooperative Revolving Loan Fund to loan out to other local economic development projects. 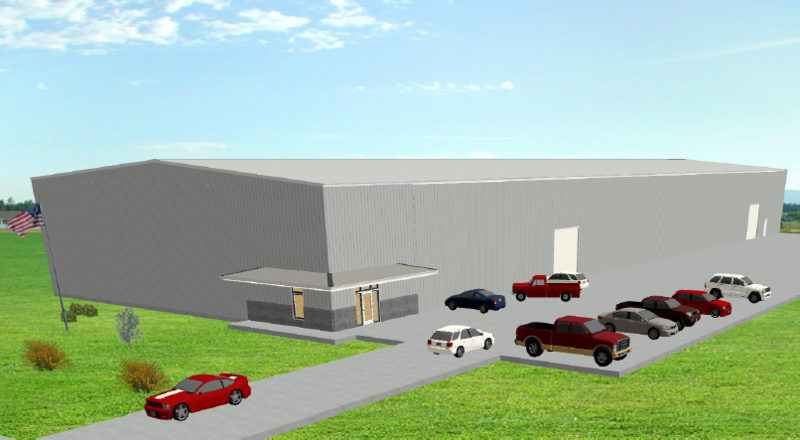 This is an artist rendering of the new Fairfield Business & Industrial Park on the south side of Fairfield. The proposed site plan is subject to change. The rendering is provided by Fairfield Economic Development Association. The City of Fairfield, Jefferson County, Fairfield Economic Development Association, Access Energy Cooperative, and Northeast Missouri Electric Power Cooperative are all members of a 28E Agreement that is moving forward with plans to construct a 30,000 sq. ft. shell building designed to attract new businesses or assist an existing business with expansion. The committee is in the process of finalizing project details and more information will be forthcoming.